Kathy Taberner and Kirsten Taberner Siggins focus on curiosity in leadership development. Kathy Taberner and Kirsten Taberner Siggins are a mother/daughter executive coaching team with a focus on curiosity in leadership development. After 10 years of coaching leaders in organizations, they recognized a need to leverage the curiosity skills that we already have in order to support our success – both personally and professionally. While coaching supports learning, curiosity creates it! Together they founded the Institute Of Curiosity, a coaching and training organization that helps individuals learn and apply the skills of curiosity to personal and professional relationships. 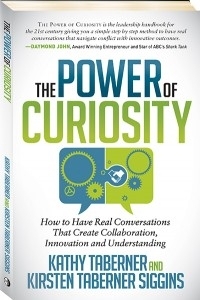 Kathy and Kirsten are the authors of The Power of Curiosity: How To Have Real Conversations That Create Collaboration, Innovation and Understanding (Morgan James 2015) which is based on 10 years of working with leaders and parents, giving you the skills and method you need to stay curious and connected in every conversation. Kathy is a co-founder of the Institute Of Curiosity, coauthor of The Power Of Curiosity: How To Have Real Conversations That Create Collaboration, Innovation and Understanding (Morgan James 2015), and a Certified Executive Coach with the designation of Professional Certified Coach (PCC) through the International Coaching Federation. She serves on the Ethics Review Committee for the ICF, and has served on various non-profit boards and works as a volunteer for organizations that support women. Kathy’s experience has taught her that the leadership of an organization must work with its constituents to build a culture of understanding, collaboration and respect, one that is aware of the employees’ needs as human beings if an organization is to thrive as a productive, sustainable enterprise. Kathy is a retired occupational therapist who was in industry, working with and integrating disabled employees back into the workplace in a way that worked for everyone. She completed an MA in Leadership, where her project focused on the leadership styles and emotional intelligence of women in senior leadership positions and since then has focused her work on supporting others in developing their leadership skills. A huge focus of this work has involved supporting leaders as they build their communication skills as part of enhancing their leadership skills. Kathy has published in the IJCO International Journal of Coaching in Organizations: “Healthcare Professionals: Learning a Different Conversations”(2011, 8(3), 71-78), IJCOIssue318052011 kathy article published. Kathy has received the Prism Award from the International Coaching Federation (Vancouver) for her work with the British Columbia Provincial Health Authority in the area of coaching and leadership development. Kathy shares her time between the Okanagan and Vancouver, British Columbia. Kirsten is a co-founder of the Institute Of Curiosity, coauthor of The Power Of Curiosity: How To Have Real Conversations That Create Collaboration, Innovation and Understanding (Morgan James 2015), and Certified Executive Coach. After receiving her BA from Dalhousie University Kirsten followed her curiosity, traveling and working in the entertainment industry with companies such as Warner Music London UK, American Idol, and AOL, learning very quickly the importance of communication skills and building relationships in a constantly evolving landscape. Kirsten earned her certificate of Executive Coaching at Royal Roads University, and continued to work with executives and leaders in the entertainment industry. With the birth of her first child, Kirsten gained a greater appreciation of the importance of communication as a parent, and the deep influence it has on the development of our children as leaders. Her work taught her that how parents spoke to their kids when they were young influenced how the kids showed up later as leaders. Kirsten is passionate about working with parents (and teachers) sharing the Curiosity Skills found in The Power Of Curiosity to keep them curious and connected in conversations. Kirsten also works with young leaders through The Children’s Hospital Young Women Working Together Leadership Institute. As leaders or parents (or both), navigating difficult conversations is part of our job description. How do we keep calm andachieve a productive outcome, all while keeping our relationships intact? The secret is curiosity. It’s the innovation-driving, emotion-calming skill that comes naturally to us as kids, but gets buried so easily beneath our busy, multitasking lifestyles. The good news is that we just have to relearn what we already know! Imagine approaching even your most challenging conversation with a sense of calm and even excitement, confident you’ll achieve a win-win result and a stronger relationship than before. That’s the power of curiosity.